So it's that time of year again when everyone starts thinking about red noses. It seems to have become quite popular for celebs to attempt some sort of physical feat; in 2009 Chris Moyles, Radio 1 breakfast presenter, amongst others bravely ascended Kilimanjaro. This year presenter Dermot O'Leary, Craig David and Radio 1's Scott Mills are trekking the Kenyan Desert. Of course it's great that celebs are out there raising money (and of course their profiles) but you have to wonder if it's more of an "off-setting" than a true benefit. I mention Radio 1 twice as it whilst listening this year I was reminded of the irony. During the breakfast show a few weeks ago, the team sent "Comedy Dave" to the shop, he returned with treats that he named, he had bought "Toffee Crisps", which of course are made by Nestlé. They've now announced Chris and Dave are raising funds for Comic Relief this year, by staying up for 36 hours on the air - wonder if they will sustain that with Nestlé treats? Contributes to the unnecessary death and suffering of infants around the world by aggressively marketing baby foods in breach of international marketing standards. 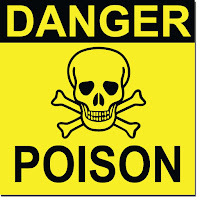 Nestle have consistently found to be responsible for more violations of the requirements than any other company. 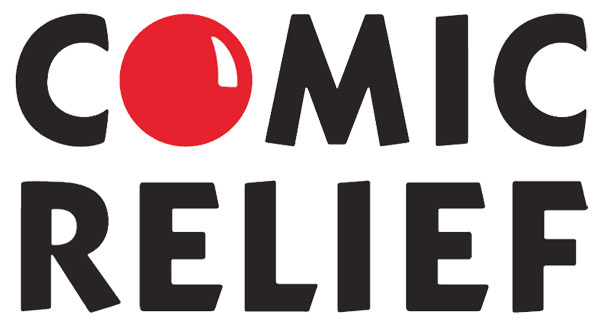 Of course Radio One aren't the only celebs in on the Comic Relief action; indeed this year the rather delectable James Corden has donated his entire fee for presenting the Brits to comic relief! A figure estimated at £50, 000 - yet I wonder whether he would think twice at buying Nestlé's Flagship brand Nescafé? "Every day, more than 4,000 babies die because they're not breastfed. That's not conjecture, it's UNICEF fact." Marketing practices that undermine breastfeeding are potentially hazardous wherever they are pursued: in the developing world, WHO estimates that some 1.5 million children die each year because they are not adequately breastfed. These facts are not in dispute. Because of this The World Health Assembly (made up of the World's health ministries) adopted the International Code of Marketing of Breastmilk Substitutes in 1981. This code prevents companies from promoting their products, and limit them to providing scientific and factual information to health workers. It is for health workers to advise parents, not companies with a vested interest in increasing sales. The Code and Resolutions do not ban infant formula from being sold, marketed or used. It simply prevents insidious tactics being used. In the past breastmilk substitute companies were quite open about marketing. 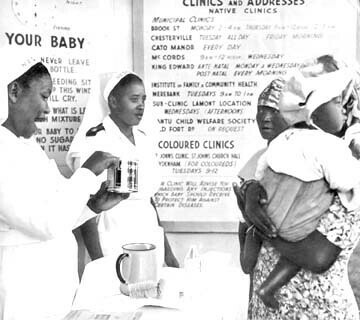 In effect what Nestlé did was to put sales women in nurses uniforms (with no nursing training) and they were sent into hospitals to give out free samples of Nestlé formula. The samples lasted until the mother's breastmilk had dried up - at which point mothers were forced to purchase formula. Not too tricky in the UK, but in developing countries the cost of infant formula can equate to more than a weeks wages (if they earn). The result was stretching of formula, by diluting it more than was recommended - but of course this is not the only problem. 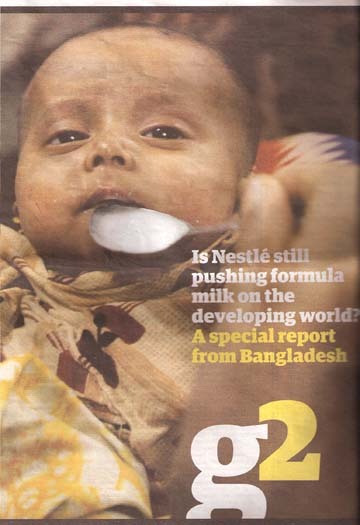 Unsanitary conditions meant that babies starved all over the developing world, whilst Nestlé profited. Pakistan - bottlefed twin girl died next day. Nestlé has rejected Baby Milk Action’s four-point plan aimed at saving infant lives and ultimately ending the boycott (ref. 4). have used the new change in product placement advertising to introduce a Nescafé coffee machine into the studio - so they can advertise for Nestle whilst "This Morning" goes out on air....nice. Of course Nestlé isn't the only offender, but they are the biggest. If they stop violating the code others will follow suit. The boycott has achieved amazing things over the years, indeed According to Nestlé's Global Head of Public Affairs, Dr. Gayle Crozier-Willi, Nestlé is widely boycotted. An independent survey by GMIPoll found it is one of the four most boycotted companies on the planet, the most boycotted in the UK, where Baby Milk Action is based. With your support they could do even more. Every little helps and the way we promote it is intended to make it as easy to support as possible. We target Nestlé's flagship product, Nescafé, while publishing a list of major brands so people can avoid the whole lot, which obviously has more impact. We produce 'Nescafé - No Thanks' cards that people can leave where Nescafé is sold requesting an alternative option. If humans aren't your thing, Greenpeace launched a campaign earlier this year; "Kit Kat - give the Orangutan a break", demanding Nestle stop using palm oil from Indonesian rain forest in said biscuit (incidentally Britain's biggest selling chocolate biscuit). A practice pushing Orangutans to near extinction and causing conflicts over land rights and resources. Meanwhile Kit-Kat gets a Fair Trade badge because the cocoa is Fair Trade (and to be honest many are questioning that) Oh and if you're in the US, Hershey make yours and they haven'tt agreed to any of the certification programs in the cocoa industry. (Find out more about how Hershey is lagging behind here). When you think of how jam packed our shelves are of alternatives, is there really any reason not to? Sure you may prefer a Nestlé brand, but when you think of the cost to others - is it really worth it? Nestlé is paying celebrities US$10,000 a tweet to push Nestlé products on Twitter, the social networking site. Another eye-opening article here! I don´t particularly like Nestle chocolates as I find them too sweet. However, it´s really difficult not to buy nestle products as they own loads of brands of things like animal foods, processed meals, bottled waters, hot drinks and more. The baby milk action group has got a list of all their products. Like you say, they are not the only ones but they are the worst. Very well written as usual! The photo of the twins makes me want to cry. Can you tell me the story behind it please? I can't quite remember it. Thank you. Nore - Making positive choices makes a Nestle boycott easy: start by choosing to buy fair trade, local and organic where possible. There are other products on the market which taste far better than Nestle anyway - like Clipper tea/coffee and Divine chocolate. We started making positive choices like this a few years ago, before I learnt about the Nestle boycott. When we started boycotting Nestle, I found that because of the positive choices we were already making, it was simply a matter of keeping an eye on the chocolate bars my children bought as treats occasionally in the shop. It is not hard to avoid Nestle products my family have been Nestle free for 11 years. There is always an alternative. That picture of the twin babies is heartbreaking. My sister and I were born at 31 weeks in 1982, and I am convinced that it was my mother's determination to breastfeed us that made us as healthy as we are today, and even as babies we had no developmental delays due to our prematurity. By the time we went home from the hospital, we were exclusively nursing and never once had a bottle. I'm in the US and learned about the Nestle boycott when researching breastfeeding when I was pregnant with my daughter. I staunchly advocate boycotting Nestle, and I tell ALL of my friends why I do it. Thanks for this post and reinforcing my stand on this issue!